Home » Uncategorized » Who’s squeezed most by tax-exempt property in their town? Who’s squeezed most by tax-exempt property in their town? At the end of the Jan. 16th Warren County Board of Supervisors workshop on sales tax distribution, Warrensburg Supervisor Kevin Geraghty said his town budget is stressed partly because of its $20-million in tax-exempt property — from the county fish hatchery and DPW facilities to the Countryside Adult Home and Hudson Headwaters’ $11-million health center. Glens Falls Ward 3 supervisor Claudia Braymer replied that the City “struggles as well, with Glens Falls Hospital” and a myriad of other exempt properties. 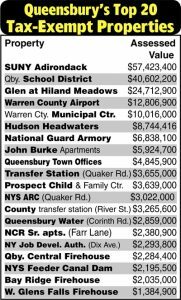 Queensbury Supervisor John Strough then said his town has $408-million in tax-exempt property, nearly 10% of the Town’s $4.172-billion total assessment. The Chronicle sought more details. Mr. Strough cited such facilities as SUNY Adirondack, Queensbury Union Free School District, the Warren County Municipal Center, Floyd Bennett Memorial Airport, Hudson Headwaters, churches, non-profits and volunteer fire companies. But his list also included individuals with property tax reductions as veterans, disabled or older than 65 years. 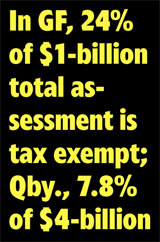 So we excluded those exemptions from the total and came up with some $328-million in large tax-exempt properties — 7.8% — of Queensbury’s assessed value of $4.172-billion. That led us to look into the City of Glens Falls, whose squeeze seems far more acute. 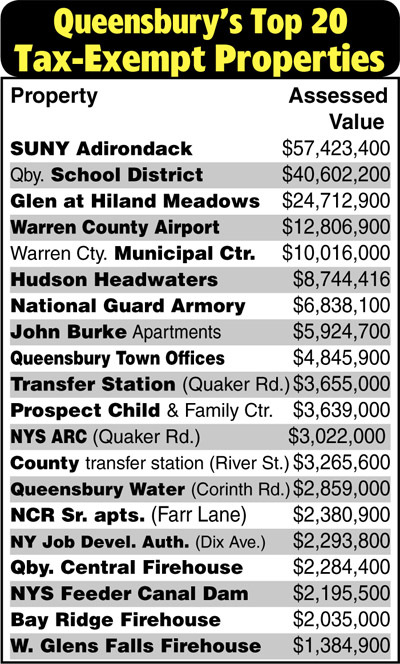 Glens Falls City Clerk Bob Curtis provided documents showing that the City has more than $253-million in tax-exempt properties — 23.96% — of Glens Falls’s assessed value of $1.058-billion. That does not include individual people with exemptions or reductions. 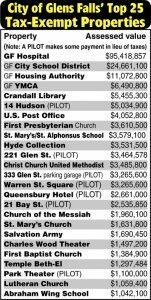 Seven properties on Glens Falls’s list of most valuable tax-exempt properties are commercial projects with Payment In Lieu Of Taxes (PILOT) agreements. 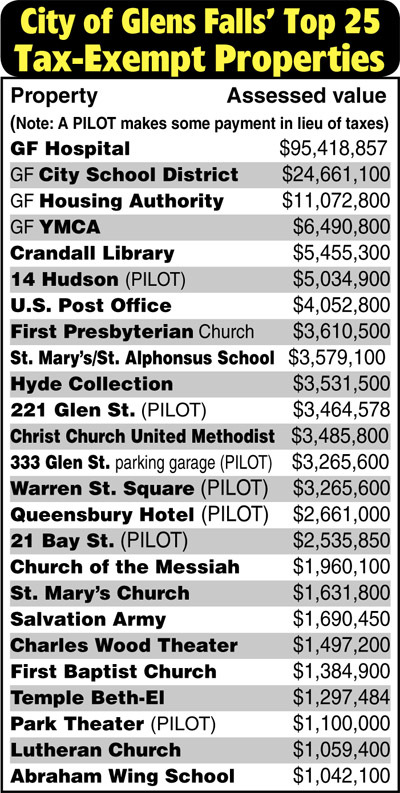 They include Sonny Bonacio’s 14 Hudson mixed-use project next to Glens Falls Hospital, assessed at $5.03-million; the Spot Coffee building at 221 Glen Street ($3.46-million); and the parking garage next to the 333 Glen Street Travelers building, at $3,265,600. PILOT agreements also apply to Suzanne and Peter Hoffman’s Warren Street Square ($3.26-million) and 21 Bay Street ($2.54-million) projects, Elizabeth Miller’s Park Theater ($1.1-million) and the Queensbury Hotel ($2.66-million). The tax exempt squeeze is one of the issues cited by some supervisors pushing to change how Warren County shares sales tax revenue with its eligible municipalities.